Gillian Welch & David Rawlings: The Fresh Air Interview Welch and Rawlings perform an in-studio concert featuring several songs from The Harrow and the Harvest, and talk about many of the lyrics they've written over the years. 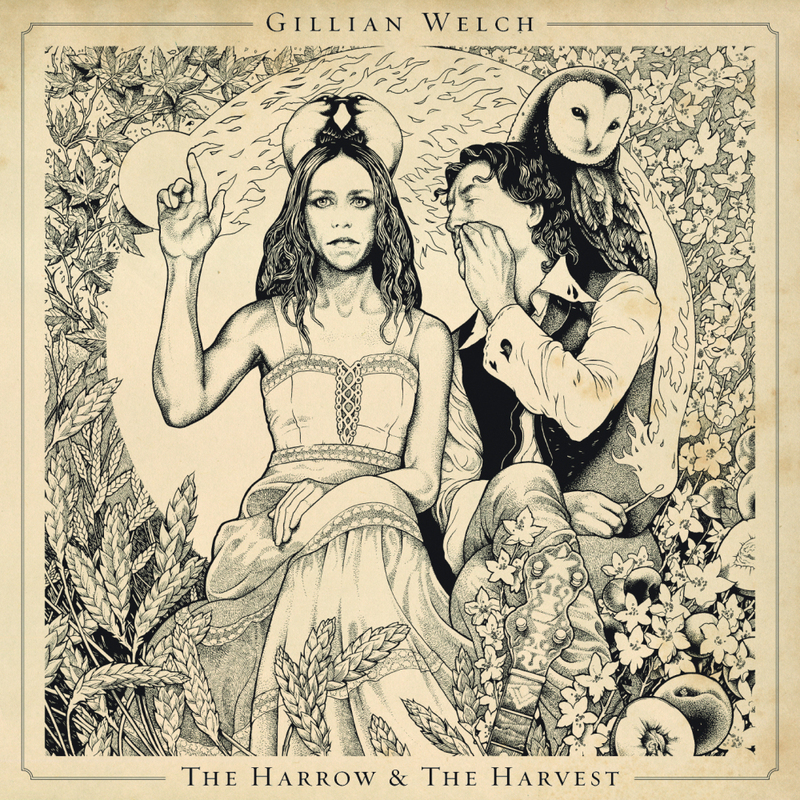 The Harrow and the Harvest is the first new album from Gillian Welch and David Rawlings since 2003. This week on Fresh Air, we're marking the year's end by revisiting some of the most memorable conversations we've had in 2011. This interview was originally broadcast on July 18, 2011. Gillian Welch and David Rawlings' long-awaited collaboration The Harrow and the Harvest came out in June, marking an almost eight-year wait for fans of their 2003 album Soul Journey. The 10 songs that make up the new album deal with some heavy subjects: identity, loss, unfulfilled expectations, death and desperation. "We've kind of half-jokingly said that this record is 10 different kinds of sad," Welch tells Fresh Air's Terry Gross. "And there are 10 songs on it." On today's Fresh Air, Welch and Rawlings perform an in-studio concert featuring several songs from The Harrow and the Harvest, and discuss many of the lyrics they've written over the years. "There's a lot of stuff on this album dealing with unfulfilled expectations and when things don't exactly go as you had thought or wished they would — and the true adult nature of dealing with that," Welch says. Welch and Rawlings met in their 20s at an audition for a country music group at Berklee College of Music. At the time, they had no plans to perform together. "At some moment, we tried to work out a song — just the two of us — and we recognized that we liked that feeling of trying to create something that was a whole picture with just two instruments and two voices," Rawlings says. "And that came partially because of a love of a lot of duet music." From the start, Welch and Rawlings were billed together as Gillian Welch. Their other albums include Hell Among the Yearlings and Revival. The two musicians also perform together in the band Dave Rawlings Machine, and have performed at the Newport Folk Festival, Coachella and MerleFest. "I started playing guitar when I was about 16, but it probably wasn't until I was 17 or 18 that I had any idea that this could be my life. At first, it seemed like a distraction or a hobby that was going to be taking me away from the things that were presumably more important. And the thing that I find strange is, if you talk to Gillian's parents when she was very young, she certainly learned things with music in the house, but she was a private child who learned to play guitar in her room by herself. There was no thought from her family that she would be an entertainer." "The main thing was finding this ... voice that I had interest in, which I'll call the quiet-yet-stoic voice: the very quiet yet very strong voice that I developed, that people would want to hear and that was worth paying attention to. I've never been the kind of person who would get up and wave my arms and scream and shout and say, 'Hey, listen to this, listen to this.' "
"I do think that the abiding mystery of my origins has definitely had a profound effect upon my writing. There is that thing in the back of my mind where I think I don't really know who I am. And it may make it a little easier to shift around in my narrative voice." "At this point, I feel like we've written a song every way you can. I've started them, Dave has started them, I've started the music, he's started the music, he's come up with the title, I've come up with the title. It used to be that I generally started the words and music and then we worked on them together, and then Dave was more of the closer. Everyone should be so lucky to have an editor as good as Dave. He's just extraordinary. In the beginning, I chalked it up to his years and years playing in bar bands where, four hours a night, he was playing songs that people like. And you learn a lot about songs that way, so he had a great sense of what good songs did and what they didn't do. And it didn't come from school; it came from playing lots of great songs."